Five years ago, Scott and I lived in San Francisco. Five years ago today, this was the view outside my hospital room window. Not too shabby, right? I didn't have too much time to enjoy it though. Four hours after being checked in and led to my room with said view, we had a baby. A baby, who minutes after being born was wide awake, her eyes wide open, ready to take on the world. A year later she had her first taste of cake. A year after that, she had her first friends from school party at Gymboree. That same year, she got to bring cupcakes to school. They made her a crazy birthday hat to wear. When she turned four she had a friends party at Bounce U. And brought more cupcakes to school (thankfully there was no crazy hat this year). 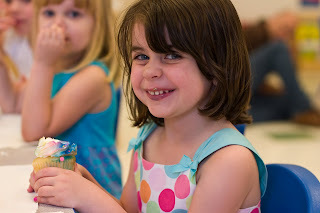 On Friday we brought cupcakes for her to share with her friends one last time at this school before she will be starting kindergarten late this summer (choke, gasp...I am working on it, really I am). And here she is this weekend, opening presents, going roller skating, to the pool, out to dinner and home for ice cream cake. We got her a doll house this year and she thanked us about 100 times randomly throughout the day. Nona and Pop Pop sent her a Leapster and she is already earning rewards by mastering the games. Her choice for dinner was spaghetti and meatballs from Buca di Bepo and her dessert of choice was Baskin Robbins ice cream cake. I chose a Hello Kitty theme and it went over very well ;). We love you sweet girl. Happy, Happy, Happy 5th Birthday. Loved seeing her Birthday pix throughout the 5 years! So sweet! I'm sure this whole going to Kindergarten thing is pretty darn bittersweet for you, Rebecca! And yes, what a hospital view you had!!! Wow it goes so fast, doesn't it. 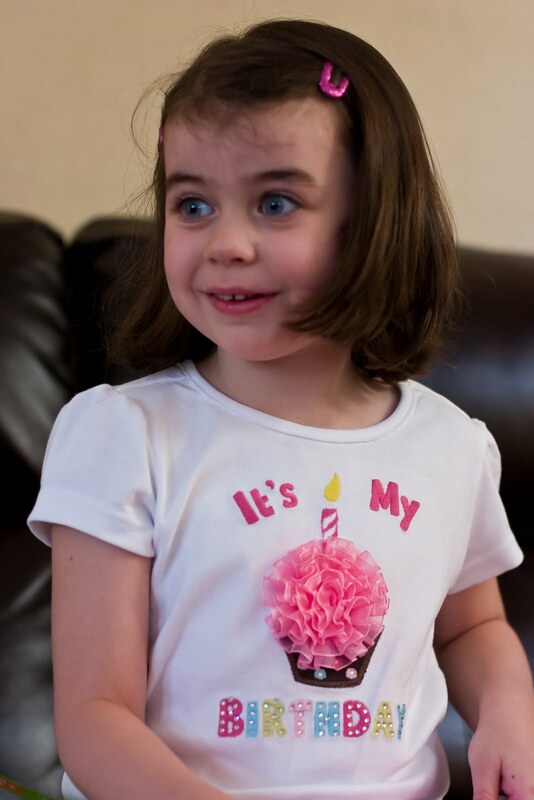 Love her birthday shirt in that last picture.